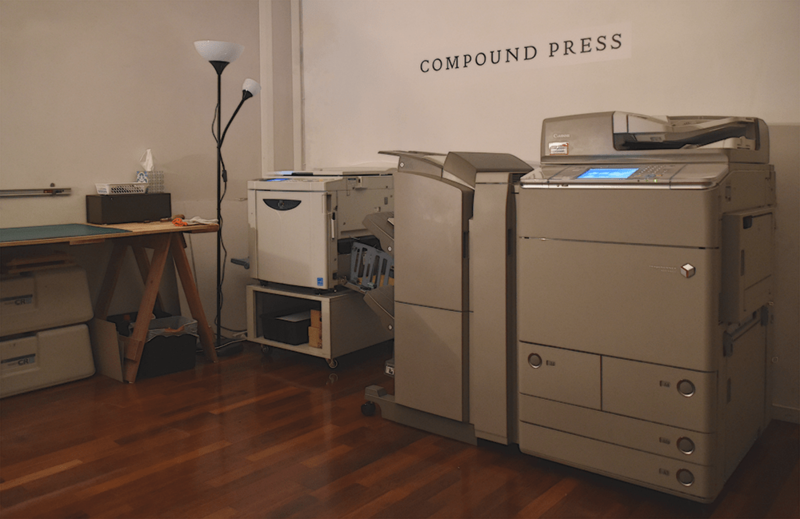 Compound Press labours to publish work we believe is vital; that is to say alive &/or important. But all too often in this deranged world that does not feel like enough. We cannot begin to know the full extent of what needs doing, & whose ideas the world craves—knowingly or otherwise. This is why Compound is offering itself as not just a publisher but also a utility at the service of artists & social or economic justice causes. For artists, we understand that lots of print shops are good at being printers, but sometimes don’t quite appreciate the right ethos & attention to detail your projects require. We’d love to collaborate on your posters, catalogues, booklets, zines—all at prices as close to cost as feasible. If your social or economic justice cause requires any printed material to get its message out, talk to us about it, & we’ll conspire to produce what you need for as close to free as possible. 100% of revenue from private artist projects will go towards helping causes in this way. We don’t have any regular pricing like your average print shop 5c per b&w page business. If you’re interested in working with us, we’re probably interested in working with you. N.B. This service is intended for New Zealand based artists & causes, but if you’re elsewhere in the world & still really want to work with us, there’s no harm in talking.